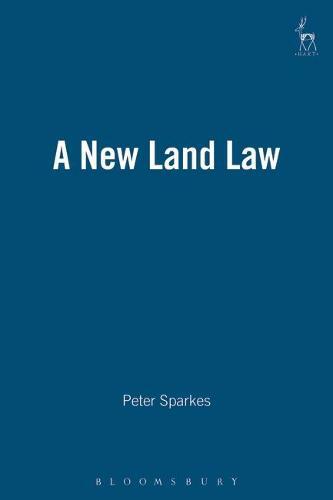 Peter Sparkes' path-breaking text on land law has been rewritten with two aims in mind: to incorporate the seismic changes introduced by the Land Registration Act 2002,along with commonholds, the explosion of human rights jurisprudence, and the unremitting advance of judicial exposition; and to accommodate the author's developing thinking on the structural aspects of the subject. The book opens with a series of shorter chapters each exploring a fundamental building block: registration; houses flats and commonholds; land, ownership and its transactional powers; social controls balanced by human rights to property; fragmentation by time (the doctrine of estates), divisions of ownership and proprietary rights. In terms of substantive chapters the book opens with discussion of the new transfer system -- paper-based transfer alongside the evolution towards electronic conveyancing -- and the consequent changes to the proof of registered titles and to the registration curtain. The new approach to adverse possession against registered titles has called for extended discussion, as has the authoritative elucidation of the concept of adverse possession in Pye. In terms of proprietary interests the fundamentals are seen as rights to transfer, beneficial interests under trusts which are overreachable, burdens which are endurable, leases, money charges such as mortgages which are redeemable, and the obligations enforcible within the neighbour principle -- easements, covenants and positive covenants being treated as a semi-coherent whole. An attempt has been made to assist students by moving some of the more arcane learning later into the book or into separate chapters where these matters might be more readily ignored by a candidate concerned primarily to prepare for an examination. "A massive amount of research and scholarship has gone into the book, with impressive citation of cases, articles and case-notes, and of other text-books. This newcomer on the scene is a considerable addition to the ranks of serious text-books on land law and the author is to be congratulated." The New Law Journal "The scope of this work is ambitious...it is a bold attempt to take the study of land law forward...much more than a basic land law text book...it would be a pleasure to be able to teach a course requiring students to cover the substance or the bulk of it whether in one or more modules. ..a difficult blend of background and history, massive referencing, discussion of statute and case law, all wrapped up in a text that is not too difficult to absorb." The Law Teacher "A most interesting and ground breaking book" Michael Cardwell, University of Leeds "At last, a brilliant land law book! I think the approach is marvellous and will strongly recommend it to my students" Keith Gompertz, University of Central England. "...takes a more modern approach to the area...I am very impressed with the style, layout and format. It will be a good teaching tool and I am looking forward to using it." Alison Dunn, Newcastle Law School. "...not baffling in the way land law texts tend to be" Helen Taylor, University of Teesside "Excellent." Professor Edward Burn, City University.